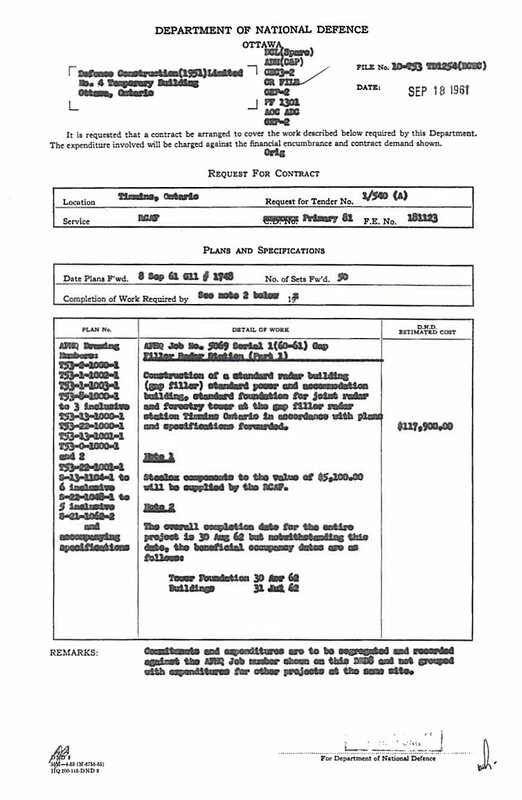 Document and Transit Receipt - 20 December 1961. Progress Statement: Gap Filler Radar Stations Southern Ontario - 8 December 1961. 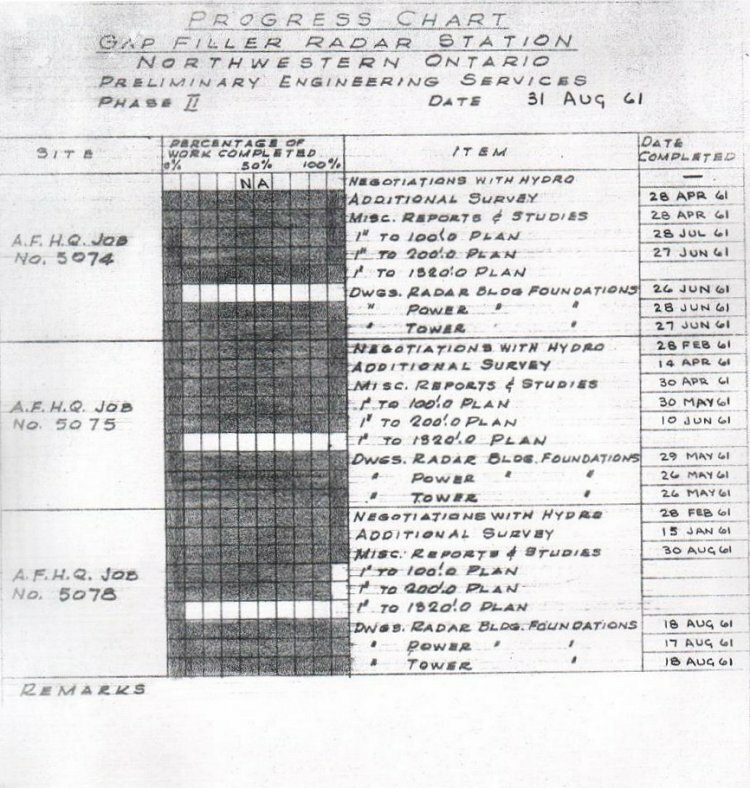 Property Acquisition: Gap Filler Radar Stations - 8 December 1961. Specifications for Standard Radar Building - 5 December 1961. Armco Steelox Buildings - 28 November 1961. Construction of Gap Fillers - 16 November 1961. 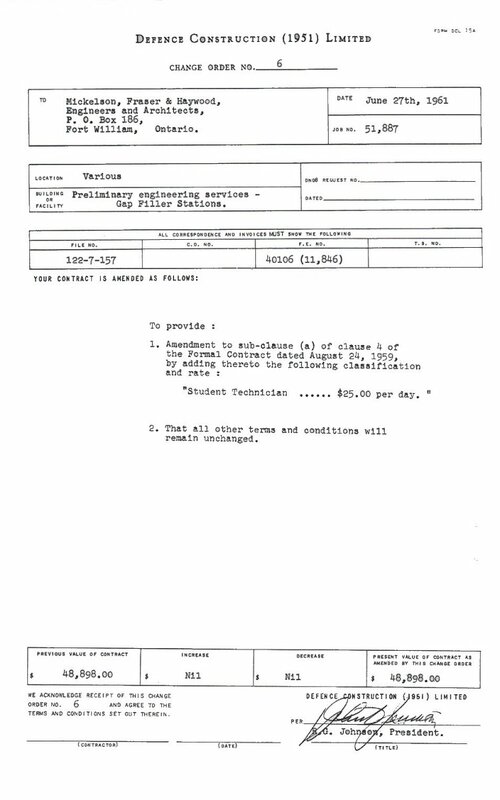 Processing of Submissions: Construction Engineering - 8 November 1961. Gap Filler Radar Stations: Resiting - 2 November 1961. Gap Filler Radar Stations: Resiting - 24 October 1961. 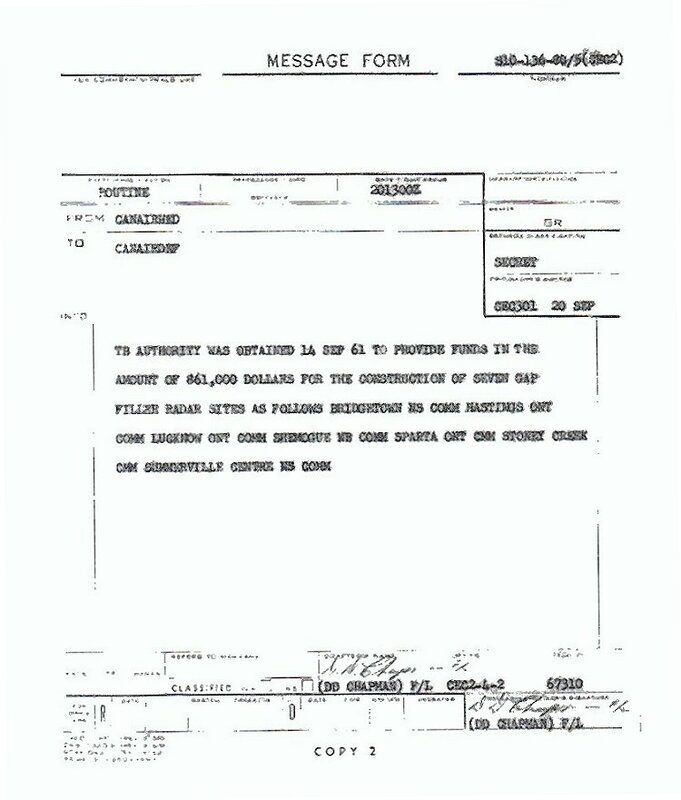 Appendix A to Resiting Report - 24 October 1961. Gap Filler Sites Eastern Canada - 20 October 1961. Gap Filler Radar Stations - 2 October 1961. Hydro Electric Power Commission - 29 September 1961. Proposed Gap Filler Sites Eastern Canada - 27 September 1961. 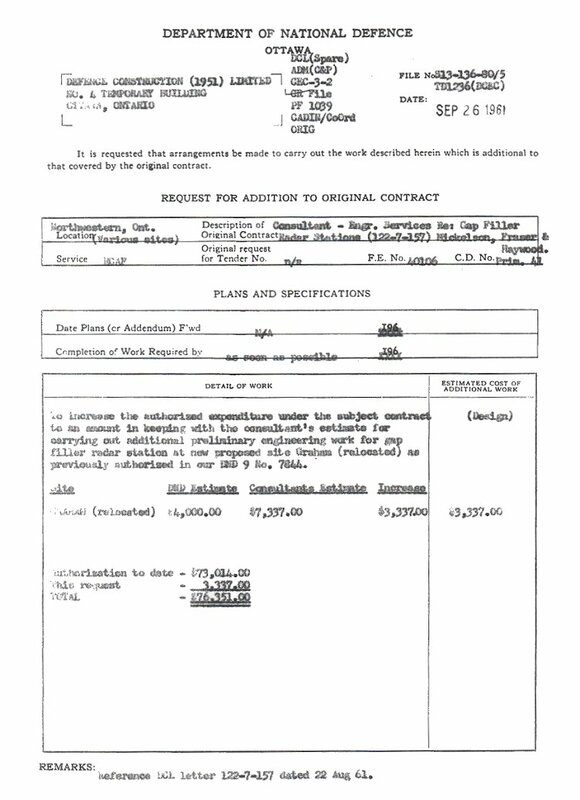 Request for Addition to Initial Contract - 26 September 1961. Gap Filler Radar Stations - 25 September 1961. Consulting Engineering Services - 22 September 1961. Construction of Gap Filler Radar Sites - 20 September 1961. Hydro Electric Power Commission - 20 September 1961. Ministry of Fishing & Hunting - 20 September 1961. 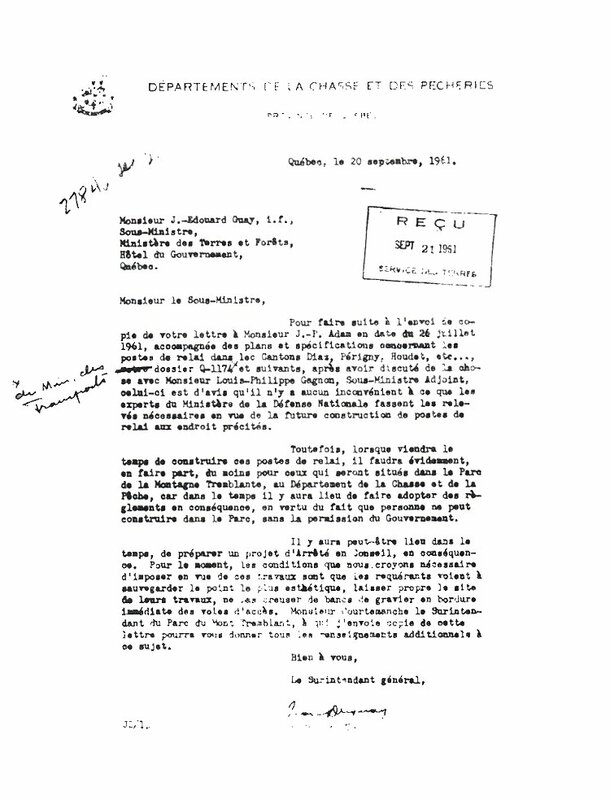 Preliminary Construction Engineering Report - 18 September 1961. Appendix A to the CE Report - 18 September 1961. 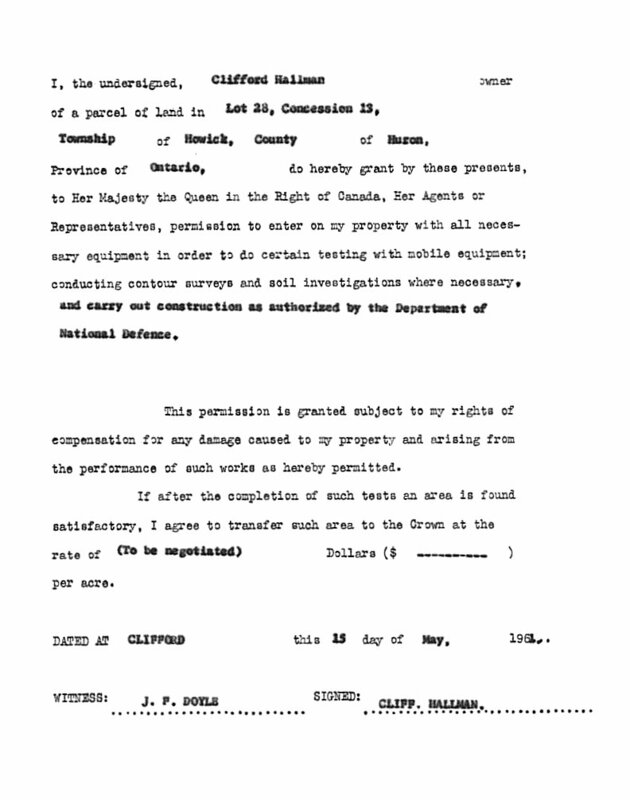 Request for Contract - 18 September 1961. Preliminary Engineering Services - 14 September 1961. CADIN Programme - 7 September 1961. CADIN Programme Construction - 7 September 1961. Progress Statement No. 11 - 5 September 1961. CADIN Progress Construction - 1 September 1961. Progress Chart: Surveys in Northwestern Ontario - 31 August 1961. Disposition of Timber from Access Roads - 25 August 1961. Fap Filler Radar Stations: Ontario - 25 August 1961. Proposed Gap Filler Sites: Eastern Canada - 24 August 1961. 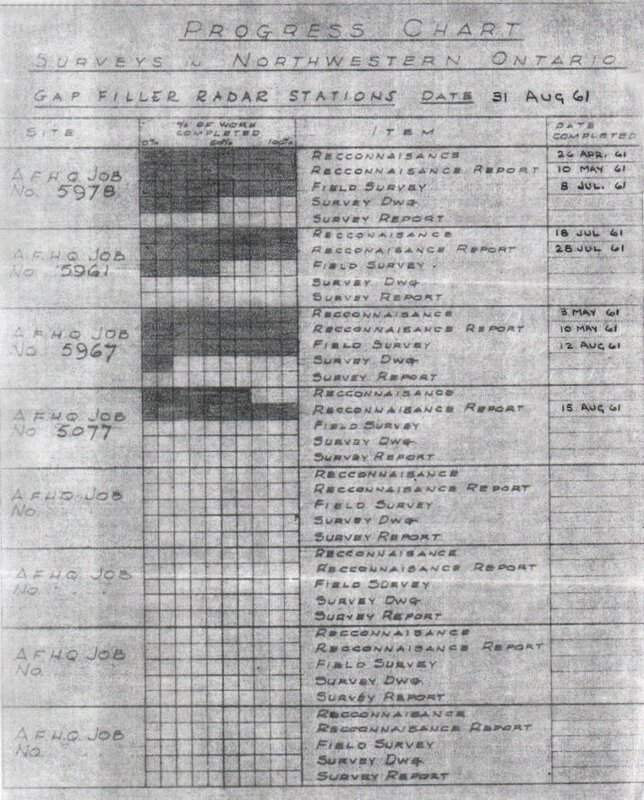 Gap Filler Radar Stations - 22 August 1961. CADIN Construction Projects - 22 August 1961. Proposed Gap Filler Stations: Eastern Canada - 4 August 1961. 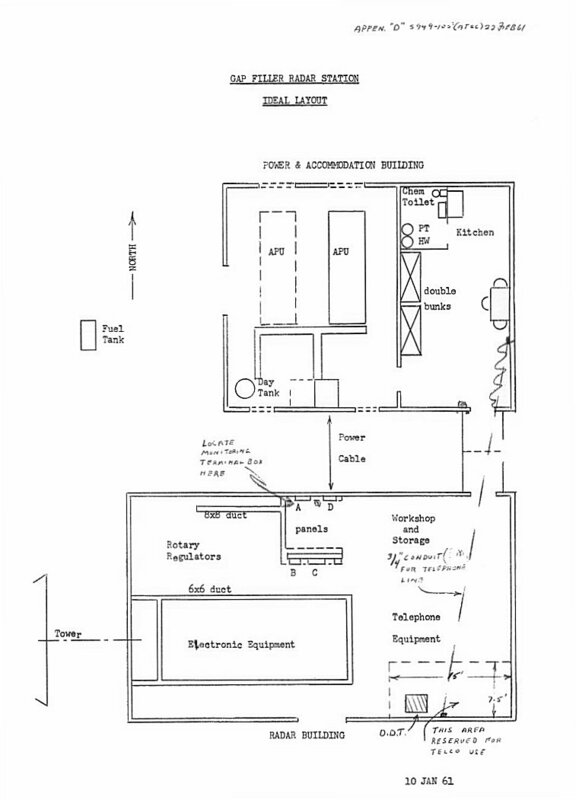 GEEIA Installation Plan - 2 August 1961. Strip Tropo Maps: Gap Filler Programme - 1 August 1961. Map: Beaver Tower - 1 August 1961. Map: Eaglet River - 1 August 1961. Map: Batchawana - 1 August 1961. Map: Gold Rock - 1 August 1961. Gap Filler Radar Stations: Removal & Replacement of Forestry Towers - 31 July 1961. Gap Filler Stations - 26 July 1961. Ministry of Forests & Lands - 26 July 1961. Fire Protection: Gap Filler Radar Stations - 25 July 1961. GEEIA Installation Plan: Gap Fillers - 14 July 1961. White Fish Lake: Gap Filler Sites - 13 July 1961. 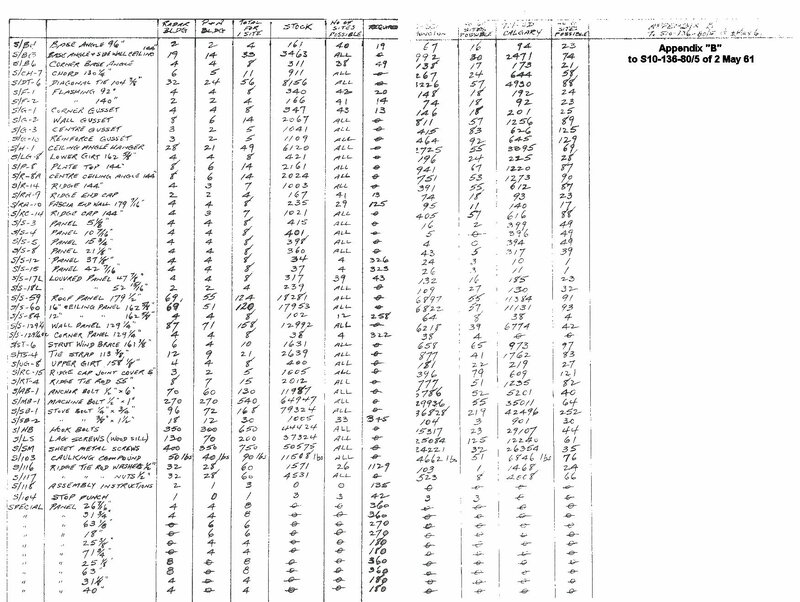 Minute Sheet - 12 July 1961. Proposed Gap Filler Sites - 10 July 1961. DND: Gap Filler Radar Stations in Ontario - 6 July 1961. Security Classification for Communication - 4 July 1961. Gap Filler Radar Stations - 30 June 1961. Preliminary Engineering Services - 27 June 1961. Gap Filler Site: Shemogue - 15 June 1961. Site Survey Reports - 8 June 1961. 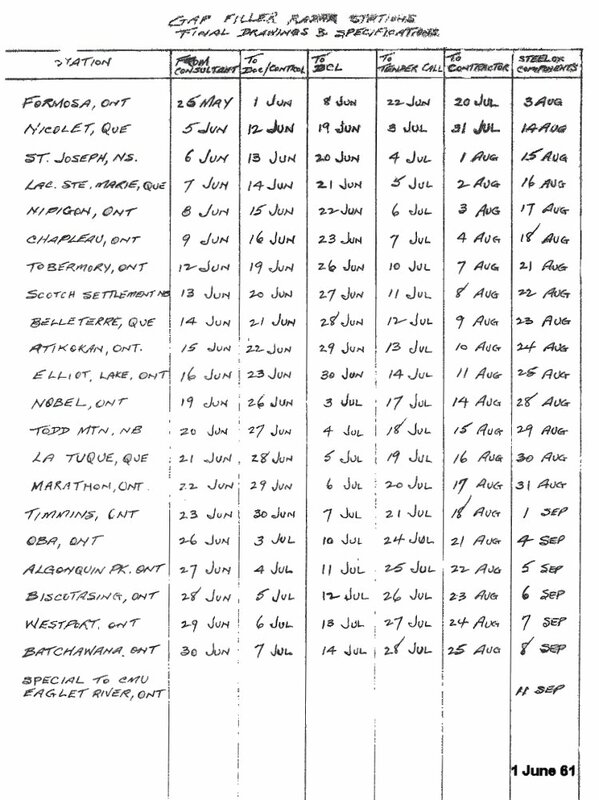 List of Gap Filler Stations - 1 June 1961. 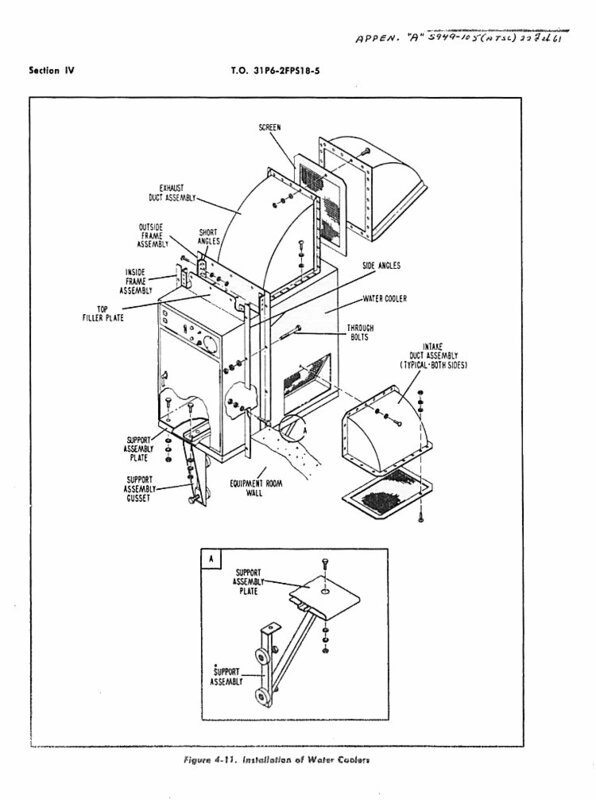 Armco Steelox Components: Gap Filler Radar Stations - 1 June 1961. 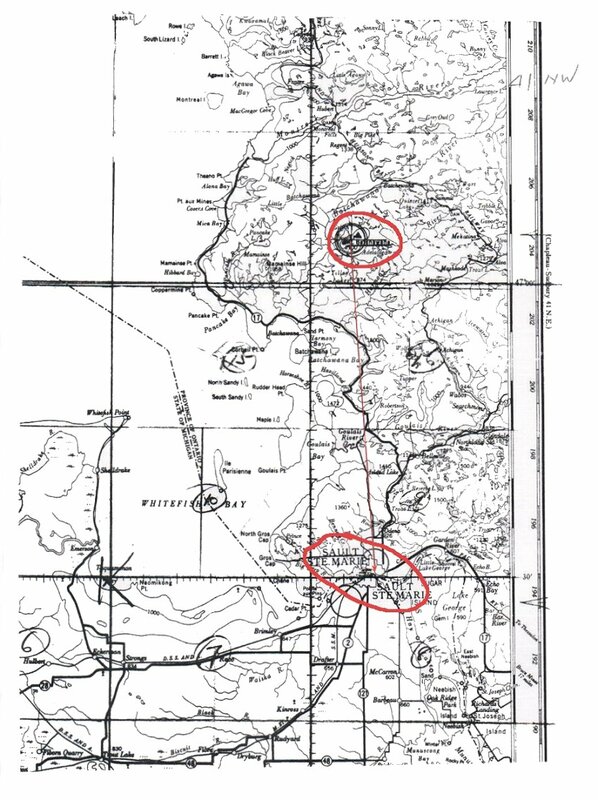 Proposed Gap Filler Sites - 29 May 1961. 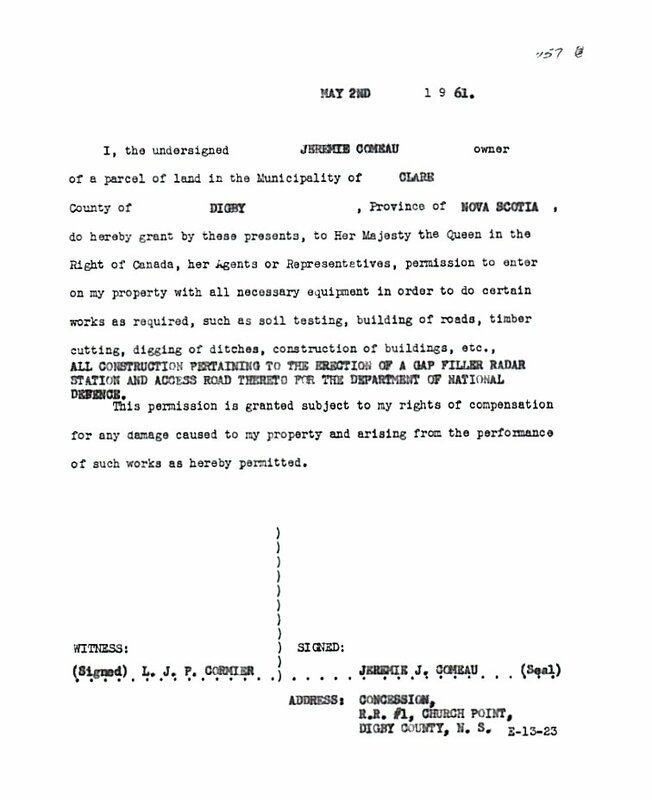 Permission to Use Land - 15 May 1961. Construction Costs - 15 May 1961. 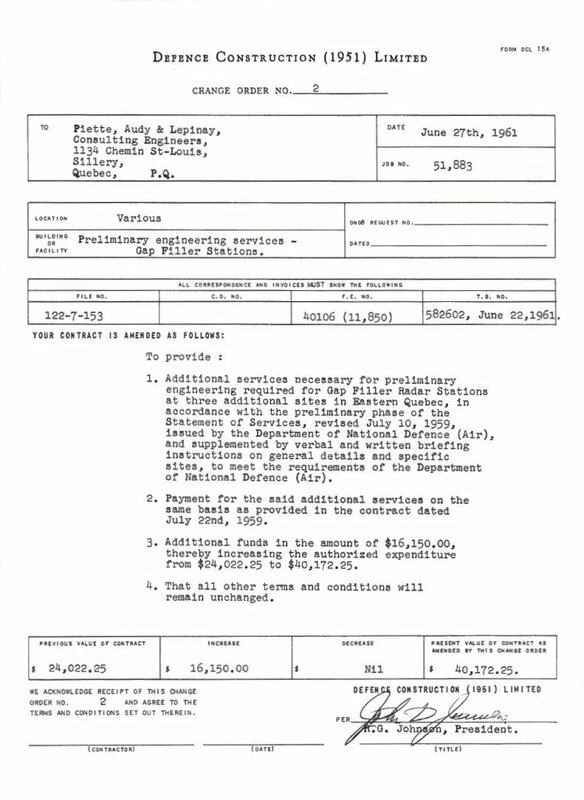 Background of Construction Costs - 12 May 1961. 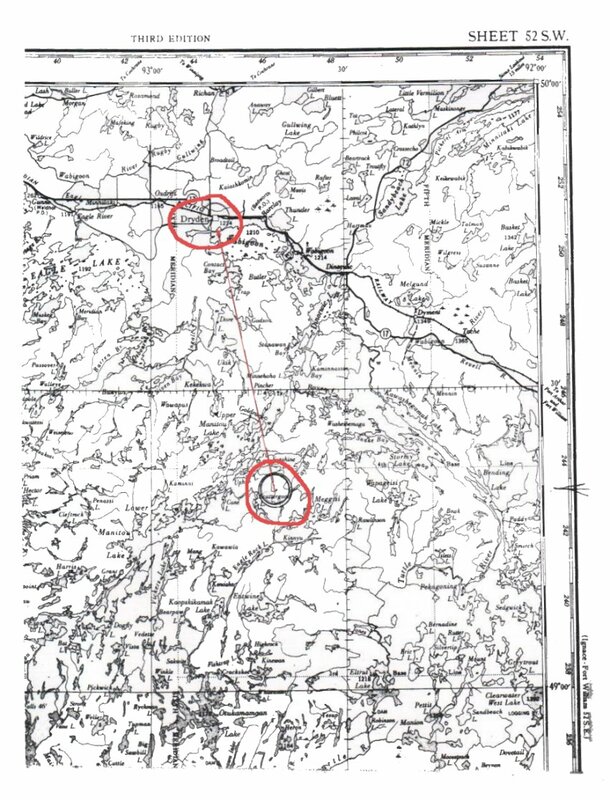 Proposed Gap Filler Sites: Eastern Ontario - 8 May 1961. Proposed Gap Filler Site - 8 May 1961. 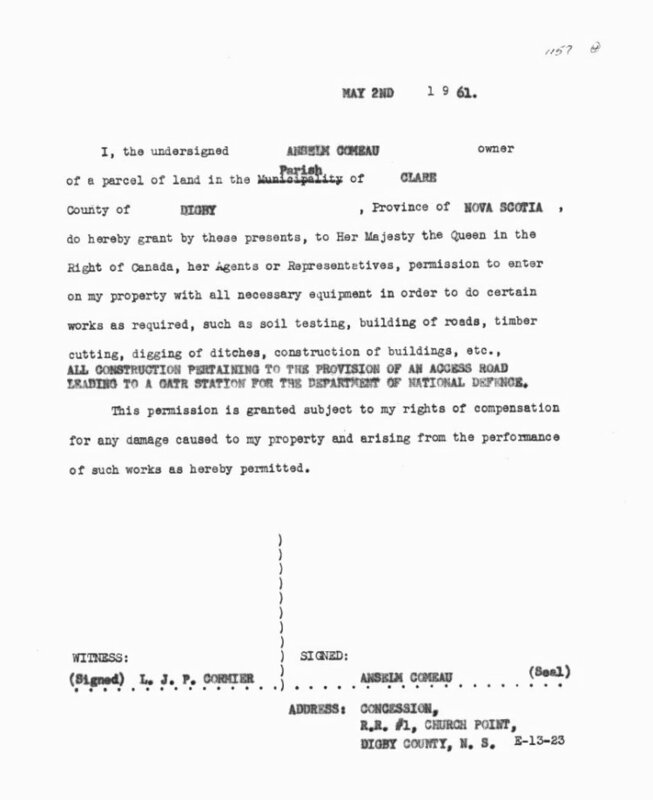 Permission to Use Land - 2 May 1961. Temporary Loan of Vehicle - 2 May 1961. Reservation of Armco Steelox Components - 2 May 1961. Appendix B to Armco Steellox Components - 2 May 1961. Steelox Components for Gap Filler Radar Stations - 2 May 1961. CADIN Gap Filler: Building Design Approval - 27 April 1961. 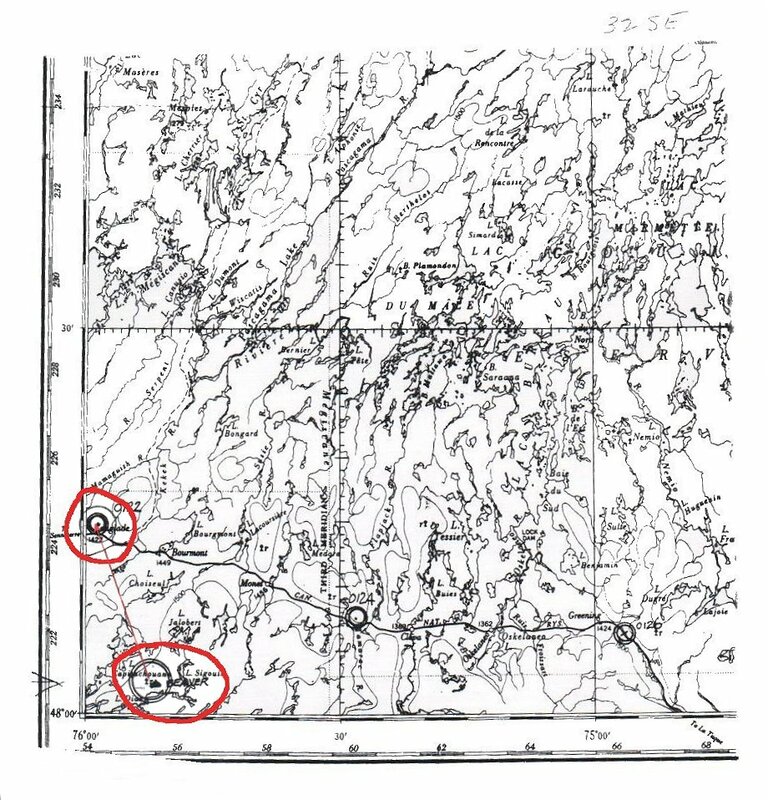 Gap Filler Radar Stations: North Eastern Ontario - 27 April 1961. Site Drawings & Sup Specifications - 24 April 1961. Approval of Gap Filler Building Drawings - 18 April 1961. Gap Filler Radar Stations: Southern Ontario - 17 April 1961. Commercial Power Supply: Gap Filler Radar Stations - 17 April 1961. Gap Filler Programme - 14 April 1961. Drawings - 13 April 1961. Gap Filler Radar Stations: North Eastern Ontario - 3 April 1961. Receipt of Map Sheets - 28 March 1961. Proposed Gap Filler Sites: Eastern Canada - 28 March 1961. Field Surveys & Soil Investigation - 27 March 1961. 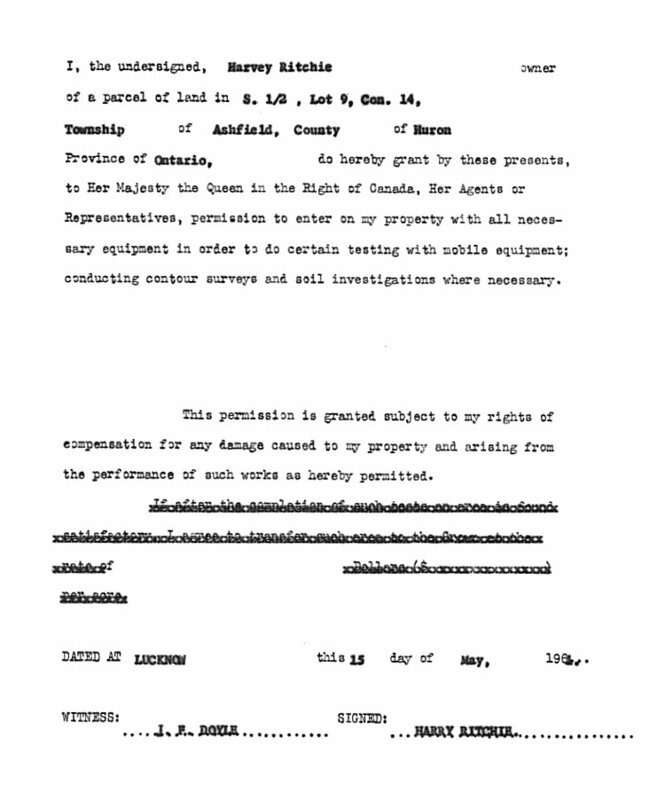 Soil Investigation - 23 March 1961. Standard Radar Building Power & Accommodation - 13 March 1961. Standard Radar Building & Power & Accommodation Building - 13 March 1961. Soil Investigation - 3 March 1961. Standard Radar Building & Power & Accommodation Building - 22 February 1961. Appendix "A" to Standard Radar Building - 22 February 1961. Appendix "B" to Standard Radar Building - 22 February 1961. 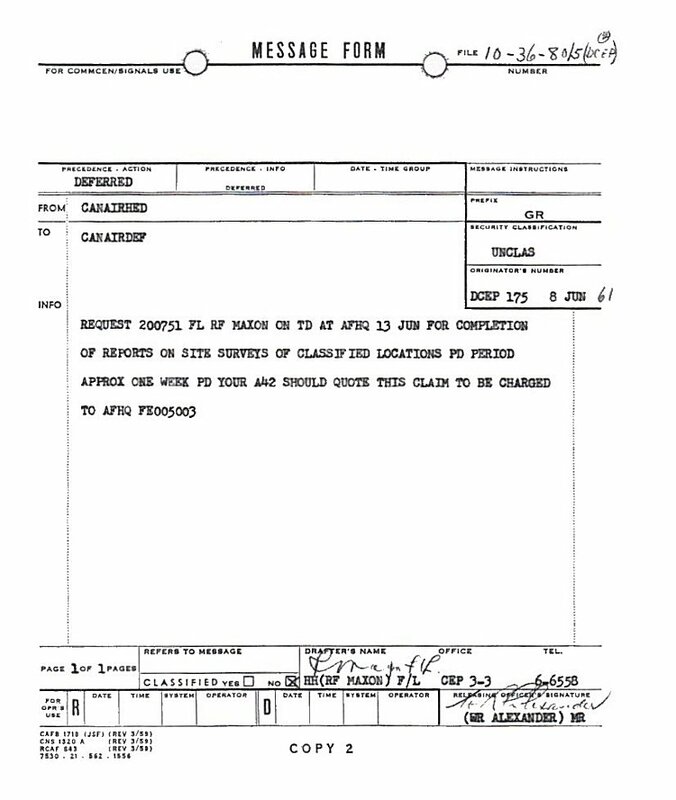 Appendix "C" to Standard Radar Building - 22 February 1961. Appendix "D" to Standard Radar Building - 22 February 1961. Design Plans - 21 February 1961. Proposed Tender Calls - 9 February 1961. 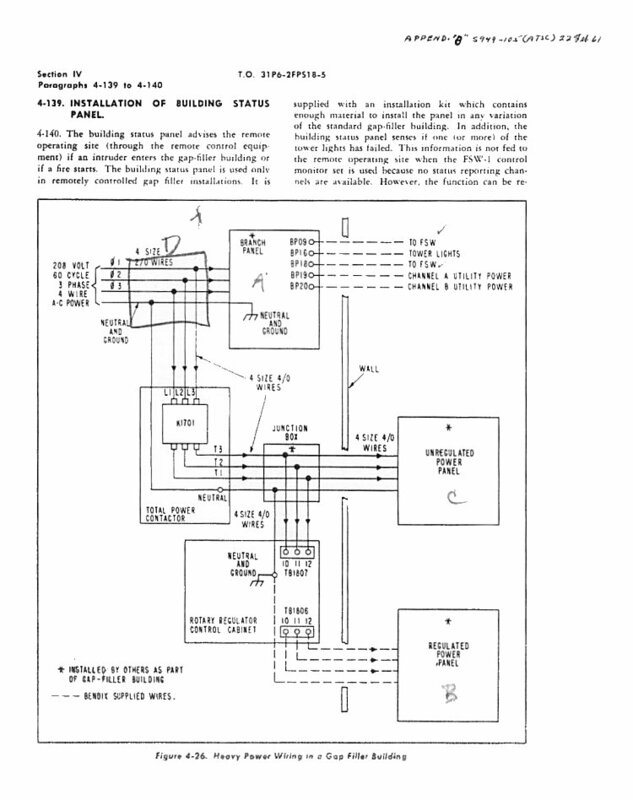 Standard Foundation Design for Buildings & Towers - 8 February 1961. 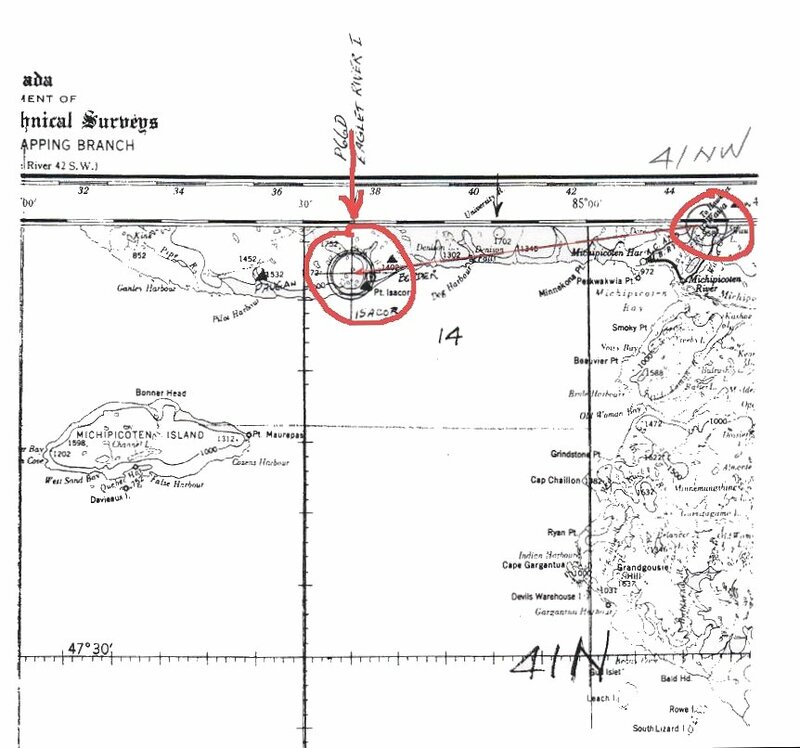 Soil Investigation: Maritime Sites - 7 February 1961. Standard Radar Building & Power & Accommodation Building - 23 January 1961. Final Design: Gap Filler Radar Stations Western Quebec - 16 January 1961. Final Design: Gap Filler Radar Stations Western Quebec - 9 January 1961. 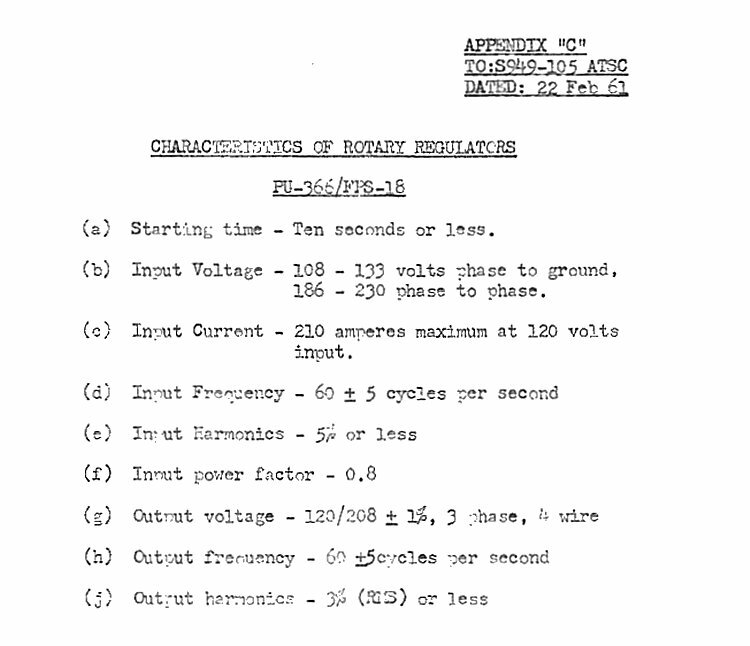 Electrical & Mechanical Requirements - 11 January 1961.